With Rob Cowan. My Favourite Gypsy-Style Showpieces; Music in Time: Brahms: Piano Sonata No 1; Artists of the Week: Staatskapelle Dresden, performing Beethoven's Symphony No 1. Gypsy music has inspired generations of composers to write some of their fieriest and most appealing lighter, and sometimes not-so-light, music. Rob's selection ranges from authentic gypsy tunes played by the great Romanian violinist Grigoras Dinicu (and an Enescu Rhapsody that was inspired by them) to Brahms Zigeunerlieder and Strauss's effervescent Gypsy Baron overture. Take part in today's musical challenge: listen to the clues and identify a mystery musical thing. 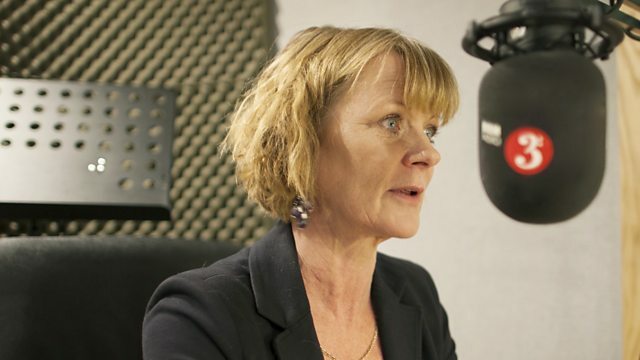 Rob's guest is the celebrated actress Samantha Bond, one of our most versatile actresses. Born into an acting family, her great uncle was a music hall performer and her father was in The Onedin Line, Samantha is famous for her appearances as Lady Rosalind Painswick in the worldwide hit Downton Abbey and the role of Auntie Angela in the comedy series Outnumbered. Her notable stage and screen appearances also include Juliet in Shakespeare's Romeo and Juliet with Kenneth Branagh, Dirty Rotten Scoundrels with Robert Lindsay, and Miss Moneypenny to Pierce Brosnan's James Bond. Through the week, Samantha shares her favourite pieces of classical music with Rob. Rob places Music in Time. Today he samples the work which Johannes Brahms presented to the world as his Opus One: his Piano Sonata No 1 in C, written when he was only 19. It's a virtuoso, highly romantic work, with an opening which seems to pay tribute to Beethoven. The Staatskapelle Dresden visits the Proms this week with Principal Conductor Christian Thielemann. With a roll-call of past directors that have included Schütz, Weber and Wagner, the orchestra is one of Europe's musical glories, its sound warm yet transparent, full-bodied and dynamic. Rob chooses a diverse and distinctive roster of recordings from Vittorio Negri in Vivaldi to Herbert Blomstedt in Beethoven and Otmar Suitner in Tchaikovsky. Orchestrator: Johannes Brahms. Orchestra: Gewandhausorchester Leipzig. Conductor: Kurt Masur. Performer: Ian Watson. Orchestra: The King’s Consort. Director: Robert King. Performer: Aaron Rosand. Orchestra: Southwest German Radio Orchestra. Conductor: Rolf Reinhardt. Ensemble: His Majestys Sagbutts and Cornetts. Orchestra: Royal Philharmonic Orchestra. Conductor: Vladimir Ashkenazy. Ensemble: Kronos Quartet. Performer: Astor Piazzolla. Orchestra: Staatskapelle Dresden. Conductor: Herbert Blomstedt. Orchestra: Orchestra of the Age of Enlightenment. Music Arranger: André Caplet. Orchestra: Seattle Symphony. Conductor: Ludovic Morlot. Samantha Bond reads from the work of Shakespeare and his contemporaries.